Thermo Scientific™ Gross Gamma Food Monitor with its NaI(TI) detector provides highly sensitive gamma measurement in a simple to use format. It is a portable solution for food monitoring application. Fast and reliable detection of radioactivity in food is achieved by the combination of a high performance handheld Gamma Personal Radiation Detector (PRD) and the portable Gamma Laboratory Kit. 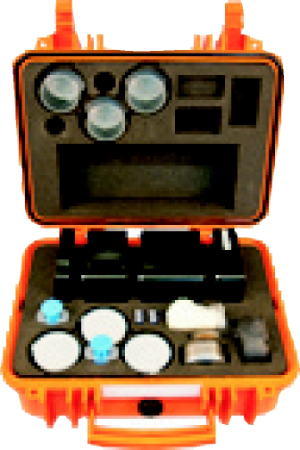 The sample holder of the Gamma Laboratory Kit contains 4 shielding modules that provide 4 pi shielding. Two sample containers, each holding 90mL, are placed in a sandwich configuration around the RadEye PRD-S for optimized response. The optional Thermo Scientific 9g Lutetium Test Adapter provides the capability to perform QA checks on system operation.